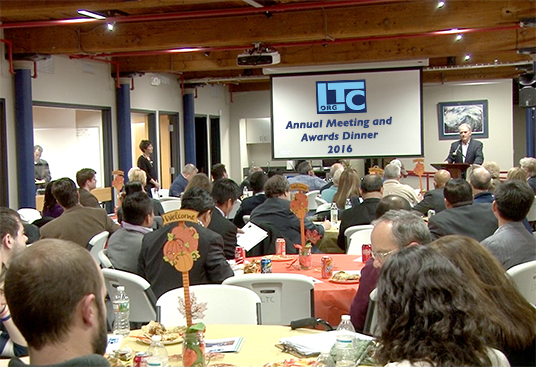 Members and guests enjoyed a delicious potluck supper and delightful camaraderie at LTC’s 2016 Annual Meeting and Awards Dinner. As usual, honoring our 2016 award winners was the highlight of the evening. Congratulations and thanks to the recipients. We were very pleased to have Senator Eileen Donoghue as our guest speaker. She is an ardent and long-time supporter of public access television. She recognizes its importance to local communities and has pledged to continue advocating on our behalf, particularly in the current push to have Comcast air our local channels in HD. We welcomed three new member representatives elected to LTC’s Board of Directors: Jim Peters, prolific LTC producer; Maritza Grooms, Teen Coordinator at Girls Inc.; and Visal Chin of the Cambodian Mutual Assistance Association. We also said farewell and thanks to the President of our Board of Directors, Jay Linnehan, for his many years of service on the Board. Anne Sheehy has taken over the role of President. Be sure to check out our 2016 Annual Report for a review of the past year’s accomplishments and a look ahead to 2017.